The Japanese battleship Fusō (Japanese: 扶桑, an old name for Japan), was a part of the Imperial Japanese Navy, the lead ship of the Fusō-class. She was laid down by the Kure Kaigun Koshō on 11 March 1912, launched on 28 March 1914 and completed on 18 November 1915. Her 356 mm (14 in) main gun turrets were placed in an unorthodox 2-1-1-2 style (with her sister shipYamashiro having her third turret reversed when compared to Fusō) and with a funnel separating the middle turret placement. This arrangement was not entirely successful as the armoured section was needlessly lengthened and the middle guns had trouble targeting. However, Fusō's relatively fine hull form allowed her to reach a speed of 22 kn (41 km/h; 25 mph). Like all battleships of the time, she was extensively modified in the mid-war years and participated in many events of WWII. For more, follow the link in the Reference section. As I have mentioned a few times, Aoshima has come a very long way since their first rather terrible kits of the early 1970s and now produce some of the finest kits you can find. This kit of the Fuso is typical of their recent productions. Molded in a nice grey plastic, the kit provides all the bits you will need to reproduce her 1938 fit. 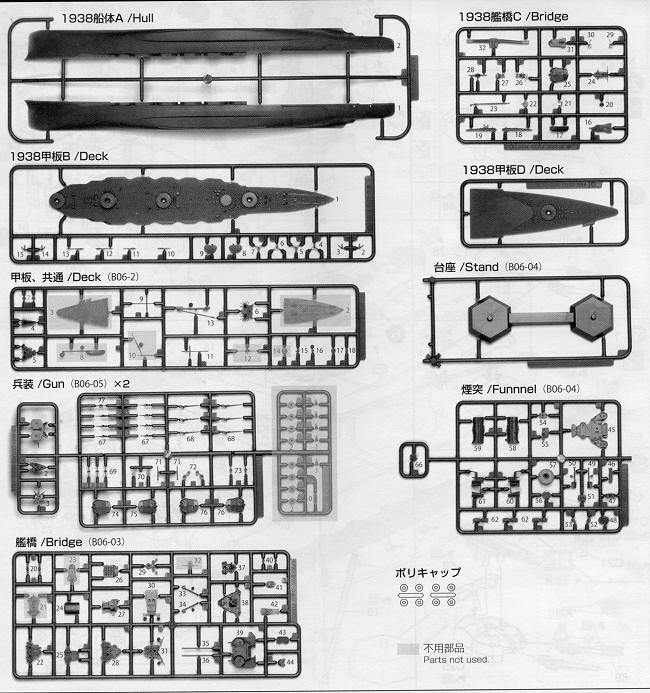 As you can see from the sprues shot, there are parts not used on this particular build which hints at either an earlier or later fit or those parts are for her sister ship, Yamashiro. Molding is a combination of raised and engraved detailing. There is no photo etch, but there are plastic retainers for the main turrets, which will allow you to reposition them as desired. It is full hull only and so comes with a display base. All of the major caliber guns are separate and molded with blast bags. The AA guns are simple constructs. This is not a fiddly kit as are some 1/700 kits you may have seen or built. Not being fiddly does not mean not being detailed as there are certainly enough small caliber guns, rangefinders and searchlights to satisfy and make things look properly busy. Basically, one builds up the various upper deck sections then adds them to the main deck and encloses this all in the hull halves. The hull does not have the separate bulkheads we see on many new 1/350 ship kits, but there are reinforcements that should alleviate any concerns about a warped hull. Though there is not any aircraft shown in the instructions, the kit comes with sprues marked "Navy Ordnance; Leviathan Vessels" which contain many of your AA guns and a selection of catapult aircraft, which I have to assume contains at least one that could be appropriate to 1938. Instructions are well drawn with clear construction steps. Most of it is in Japanese, of course, and so offers Gunze paint references. The painting scheme is for a Dark Grey ship with a Cocoa Brown waterline with details, like the blast bags, in white. 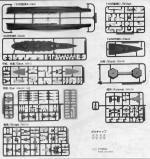 In all, an excellent kit and while waterline fans might be disappointed, most of the rest of us are thrilled to have one of the 'pagoda' battleships available as a modern molded kit.